A Minnesota woman charged with fatally shooting her boyfriend in a failed YouTube video stunt foreshadowed the event when she tweeted that it would be "one of the most dangerous videos ever." HALSTAD, Minn. (AP) - A Minnesota woman charged with fatally shooting her boyfriend in a failed YouTube video stunt foreshadowed the event when she tweeted that it would be "one of the most dangerous videos ever." Monalisa Perez, of Halstad, was charged Wednesday with second-degree manslaughter in the death of Pedro Ruiz III. Perez, who is pregnant, was released on $7,000 bail. The charge carries a maximum penalty of 10 years in prison. 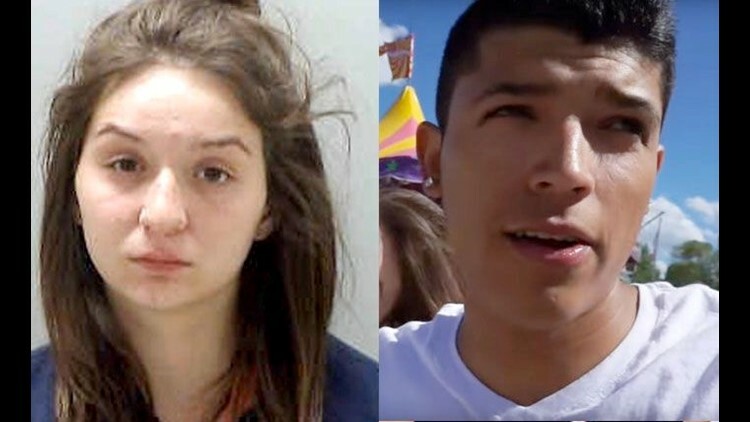 According to the criminal complaint filed by the Norman County Sheriff Jeremy Thornton, the 19-year-old Perez told investigators that Ruiz wanted to make a video of her shooting a bullet into a book he was holding against his chest. She says she fired from about a foot (0.3 meters) away. Hours before the Tuesday night shooting, Perez tweeted: "Me and Pedro are probably going to shoot one of the most dangerous videos ever. HIS idea not MINE." The complaint says Ruiz set up one camera on the back of a vehicle and another camera on a ladder nearby. Ruiz's aunt, Lisa Primeau, told the Star-Tribune that her nephew was always chasing a thrill and "putting a dangerous twist on everything he did." Primeau said that included jumping into a swimming pool from the top of a house. Many of the videos on Perez's YouTube channel are of her and Ruiz playing pranks and performing stunts. The most recent was posted the morning before the shooting. It's titled "Doing Scary Stunts at the Fair, Part I" and shows the couple attending a fair last week. Primeau said Ruiz liked guns and had "plenty" of them. Authorities say Perez used a .50-caliber Desert Eagle pistol in the stunt, which is described by retailer Cabela's in an online ad as "one of the world's most powerful semiautomatic handguns." Perez died from a single gunshot wound to the chest.